Summary: Rain, rain and more rain until mid week. A couple of days of dry weather before a chance of rain for Halloween and the rest of the weekend. Lots of weather things happening so let’s break down what you can expect today, through the work week, and into Halloween weekend. Today, expect a 90% chance of rain at your house with a high temperature of 66 degrees. Winds will be out of the east northeast at 5 to 10 mph. Today’s rain will just be that: rain. We aren’t expecting anything severe or thunderous today, just that good ole fall time rainy weather. Here’s what the HRRR simulated radar has to say today about the rain. The GIF below loops from 9am to 11pm. The models don’t quite agree with each other, however. 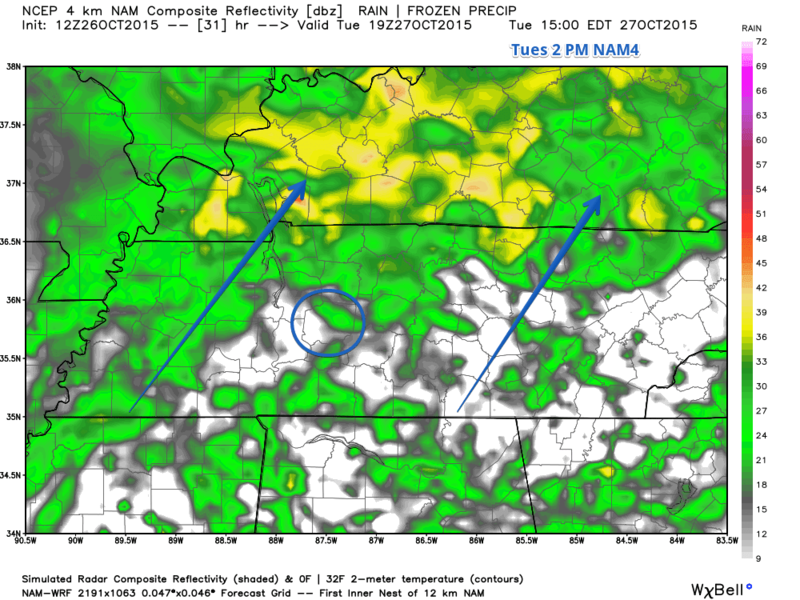 The HRRR hasn’t been very dependable, and it actually shows more rain for us today than the NAM4 model. 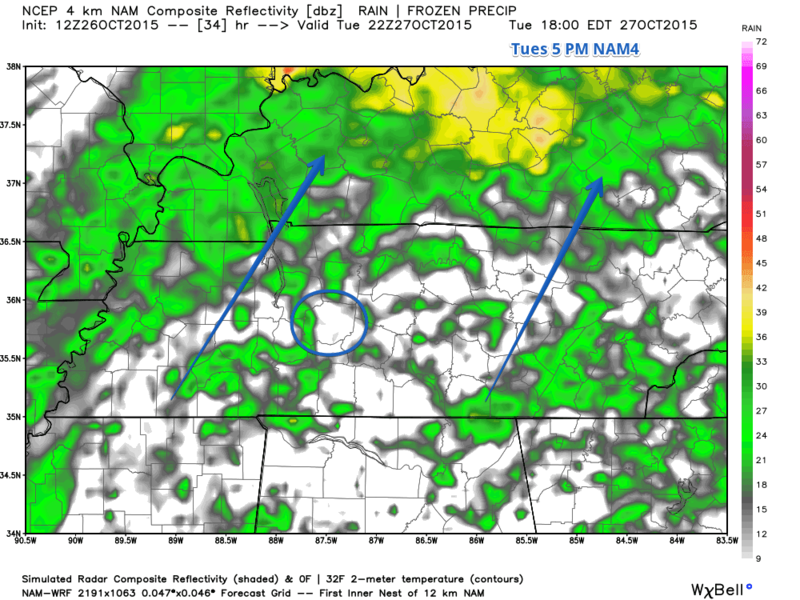 The NAM4 shows slightly less rain. Either way, you need your umbrella today. Tonight will be the same as well, with a 90% chance of rain with our low temperature dropping only 9 degrees to a mild 57 degrees. Winds turn out of the east southeast at 5 to 10 mph. Again, just rain this time, nothing severe or even lightning. 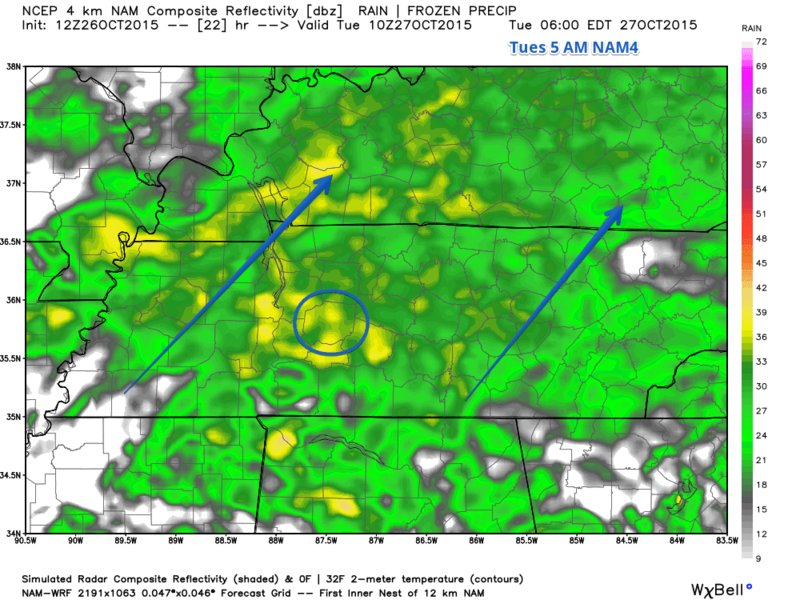 The NAM4 simulated radar is showing a soaking rain all night long and even into tomorrow as well. Here’s a couple of NAM4 simulated radar images for you at 2am and 5am. Tuesday will be a repeat of today, with a 90% chance of rain and a slightly cooler high temperature of 62 degrees (the temperature will only go up five degrees from the overnight low!). Winds will be out of the southeast at 10 to 15 mph, so it will feel like it is in the upper 50’s. The NAM4 simulated radar shows an almost constant rain until around 2pm, where the showers may break up slightly for the rest of the evening. Here’s the NAM4 simulated radars for 2pm and 5pm. Tuesday night, rain chances still remain at 90% with the overnight low only dropping 4 degrees to about 58 degrees. Winds will still be gusty out of the southeast at 10 to 15 mph, so it will feel like it is in the lower 50’s. Wednesday, things start getting better, with a 40% chance of rain and a high temperature of 68 degrees. Rain will push out in the morning hours after daybreak. 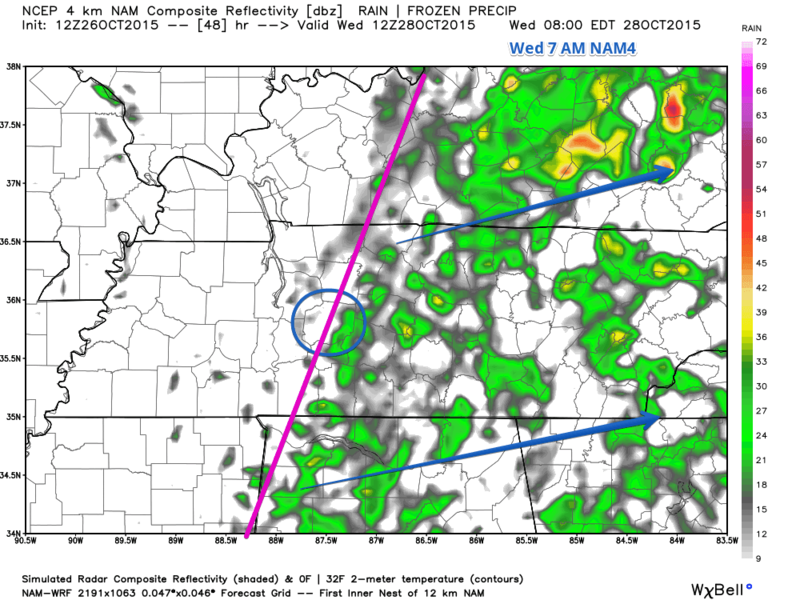 Here’s the NAM4 simulated radar for 7am Wednesday. You can see the clearing line (indicated in pink in the image above), signalling the end of the rain. The timing might be slightly off, but expect the rain to end shortly after daybreak. NAM4 also shows a very small light of spotty showers that may move in after dark on Wednesday, but it doesn’t appear to have too much rain with it right now and won’t hang around long. Wednesday night, the overnight low will drop to about 51 degrees under partly cloudy skies. Thursday is looking pretty good, with a high temperature of 66 degrees under a mostly sunny sky. This will help dry things out a bit as we head into the weekend. Thursday night the temperature will fall to about 43 degrees under partly cloudy skies. Friday also appears to remain dry, with a high temperature of 66 degrees as well under mostly sunny skies. The overnight low will drop to around 48 degrees under partly cloudy skies. Any Halloween (or other) outdoor activities appear to be dry both during the day and at night on Friday. Friday night be sure to dress warm. For anyone expecting to go trick or treating or have other outdoor plans, Saturday introduces another rain chance. Since it is six days away, it is still too early to determine when and how much we could get, but the current forecast calls for a 20% chance of rain during the day with a high temperature of 68 degrees, and a 30% chance of rain Saturday night with a low temperature of 53 degrees. It’s still too early to know about the rain, but it’s best to prep for the possibility of rain during any outdoor activities, including trick or treating. We’ll keep you updated on any rain chances for Halloween weekend and what you can expect so you can help plan your outdoor activities accordingly. Also, don’t forget to set those clocks back one hour Halloween night before you go to bed, as the end of Daylight Savings time is 2 am Sunday, November 1. Thought we were done with 70 degree highs? Not so fast. 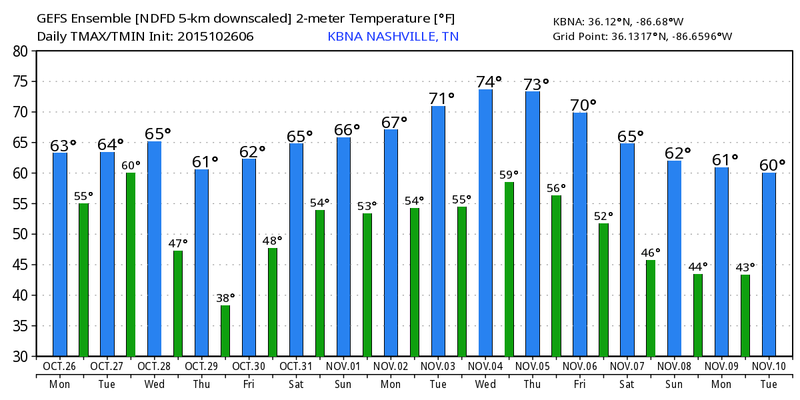 The first week of November brings us high temps in the low 70’s for a few days before returning to fall-like 60’s.